The features available in every apartment and throughout the community are sure to get your attention. 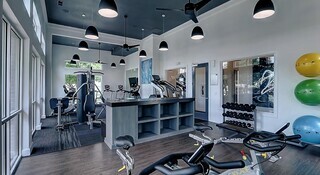 From the quartz countertops to the USB outlets in your next apartment to the swimming pool and the fitness center within the community, New Longview Apartment Homes is made for you. The apartment features at New Longview are tailored to you. Each apartment has a nine-foot Trey ceiling, wood-like flooring in the kitchen, carpet in the bedroom and a designated dining room. The kitchens in these apartments have a contemporary appeal with quartz countertops, stainless steel appliances and light wood cabinetry with fashionable silver hardware. You will appreciate the modern addition of USB outlets in the kitchen, too. Other conveniences include an in-unit washer and dryer set and walk-in closets. When you lease a home at New Longview, you can also opt for a standing shower or a garden tub, a private patio or a balcony and one of three types of views: lake, historical or urban. The perks available within this exemplary Missouri community are also made to surpass your expectations. To show appreciation for the residents, New Longview provides complimentary tea and coffee in the clubhouse and complimentary Wi-Fi in all community areas. The 24-hour fitness center offers WellBeats guided fitness programming, too. During the summer months, you can make use of the swimming pool and sundeck or plan a cookout at the poolside grilling area. The community also provides electronic package acceptance, 24-hour emergency maintenance, and online payments. New Longview is pleased to welcome your pets to the community. The community has no weight limits and is happy to have most breeds of dogs. However, because certain dogs do not thrive in a community environment, we cannot accommodate the following breeds, dogs resembling these breeds or mixes of these breeds: Akita; American Staffordshire terrier; bull terrier; chow; Doberman; German shepherd; pit bull; Canary mastiff; Rottweiler and wolf hybrid. Exotic/farm animals are not allowed in the apartments, either. Contact a leasing agent for a tour of your next Apt.